Acute Coronary Syndrome covers the spectrum of clinical conditions ranging from unstable angina to non-ST elevation myocardial infarction and ST elevation myocardial infarction. These life-threatening disorders are a major cause of emergency medical care, hospitalization and mortality. 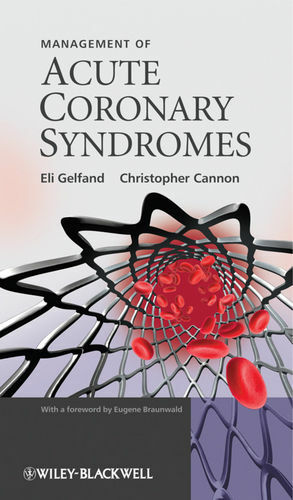 Management of Acute Coronary Syndromes is designed to provide busy clinicians with a comprehensive guide to the investigation, diagnosis and treatment of these syndromes. It encompasses the latest technologies, including the use of biomarkers and non-invasive imaging procedures. For each condition, the reader is taken through all of the therapeutic options available; in each case the indications and contraindications are evaluated in the light of the latest clinical trials. Potential complications are dealt with in a similar fashion, permitting the reader to anticipate and manage problems as they arise. The authors also present evidence-based recommendations for long-term care of at-risk patients, encompassing pharmacologic therapies and lifestyle management. The book concludes with a comprehensive collection of appendices that include treatment algorithms, risk scores and a summary of the latest management guidelines. Management of Acute Coronary Syndromes is the most up to date and comprehensive evidence-based guide to managing acute coronary syndromes, in a compact and usable format. It will be of interest to busy specialist physicians in cardiovascular medicine, cardiac and vascular surgery, and critical care, as well as primary care physicians and hospitalists who care for patients with these syndromes. Dr. Eli Gelfand is a clinical cardiologist, who provides comprehensive care for patients with a full range of heart and vascular problems at the Beth Israel Deaconess Medical Center. He is the Director of the Vascular Diagnostic Laboratory, Harvard Medical School and is the , Harvard Medial School and is the Associate Cardiovascular Fellowship Director at Beth Israel Deaconess Medical Center. Dr. Christopher P. Cannon, is an Associate Professor of Medicine at Harvard Medical School and an Associate Physician in the Cardiovascular Division at Brigham and Women's Hospital in Boston, Massachusetts. He is a senior investigator of the Thrombolysis in Myocardial Infarction (TIMI) Study Group. Dr. Cannon has published more than 500 original articles, reviews, editorials, book chapters, and electronic publications in the field of acute coronary syndromes. Dr. Cannon has received numerous awards including the Alfred Steiner Research Award, Upjohn Achievement in Research Award, and Robert F. Loeb Award for Excellence in Clinical Medicine. He is a Fellow of the American Heart Association and of the American College of Cardiology.